HOW wonderfully French to play brilliantly in a Rugby World Cup quarter-final when they were all but written off. How even more wonderful that it wasn't the All Blacks who felt the wrath. ENGLAND 12 (B. Foden, M. Cueto tries; J. Wilkinson con). England now know what it feels like to see the French coming in the rear view mirror and get it horribly wrong just how close they really are. Les Bleus smashed in at full speed and proved that once again there's a reason French World Cup games are preceded by a week of clichés. Only the French could lose to Tonga one week in a performance that was indescribably bad and bounce back the next to beat England with the sort of rugby French teams of old used to play at will. They were brutal; they were clever; they were passionate and they were clinical. Thierry Dusautoir made an insane number of tackles just as he did four years ago in Cardiff. Julien Bonnaire wasn't far behind and Lionel Nallet will be peeling himself out of bed this morning - sore and bruised - but unquestionably heroic. The surprise wasn't so much that France dug deep and found something extraordinary - it was just how easily they put England away. The English might be disastrously lacking in vision and enterprise but they are a side with inordinate volumes of flesh and muscle. It takes a huge effort to knock them down and push them back. Even more to actually open them up and find holes in their defence. The French managed to do both spectacularly well - they didn't buckle, they didn't even bend and they never lost their nerve. They even showed remarkable composure - not a known French trait - to set up for the drop goal to push themselves 19-7 ahead with seven minutes remaining. That was the cushion they needed to start feeling they were safe. To have continued to keep the door open would have been madness. They had England just about cooked but the fork had to be jabbed in and the call made that they were done. To have failed to have finished what they started would have been scandalous to the performance of Imanol Harinordoquy. The No8 was the everywhere man; the crunch in the tight and a surprisingly agile beast in the loose. Once dubbed 'Harry Ordinary' by the English he was anything but. He gave the French the momentum to play on the front foot and bring into play the axis of genius which was Dimitri Yachvili, Morgan Parra and Maxime Mermoz. Those three gave the French the cut of old. There was artistry to their craft. Yachvili used that booming left peg of his to hoist high and deep and make sure the game was never played in French territory. He threw fast and accurate ball to Parra - the sort that invited the No10 to run on to possession and already have the English defence shuffling back in a bit of a panic. Where they were deadly was in their use of the wrap around - one of them would be the pivot fixing the English defence another would scurry round and arc into the space leaving France attacking an English defence that was far from impregnable out wide. Take England on up the middle as Argentina and Scotland both tried and it can be an exercise in futility. Fix them and stretch them; force them to make one-on-one big tackles in the far channels as the French did and the rewards are rich. 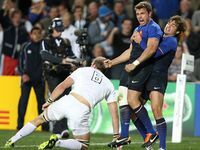 Vincent Clerc blasted through a hole created by a wrap around for the first try and it was a similar move that opened up England again for France's second. England's defensive frailties out wide became obvious during those two tries. Ben Foden and Chris Ashton lacked power in the tackle - neither man having the strength to make the killer blows required. At this level it has to be vicious - hit hard and high, smother the ball and let neither attacker nor ball remain a weapon. England didn't have it where they needed it and now have 24 hours trapped on a plane to ponder whether they want to carry on as is and believe that they should simply bash everything with a club or whether they should consider learning more subtle methods to entrap their prey. The very fact they are on a plane should provide the answer.